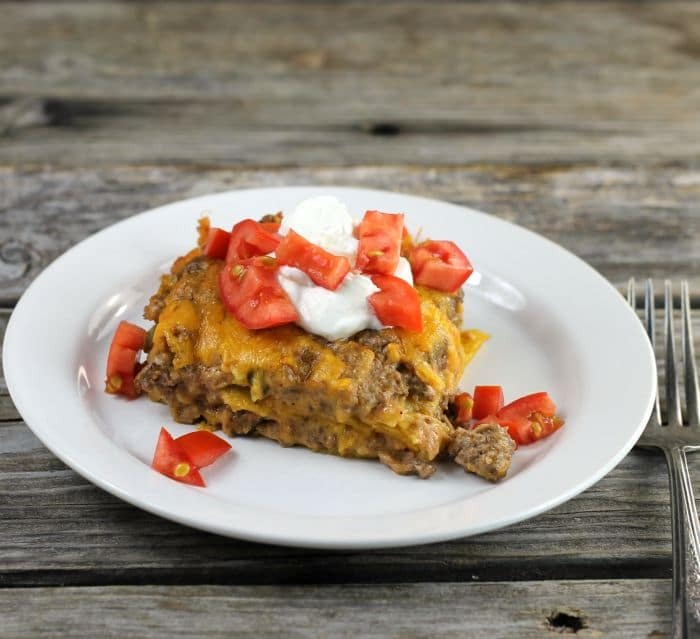 Ground Beef Tortilla Casserole is a great tasting casserole with taco flavors that the whole family will love, try it for your next Taco Tuesday. 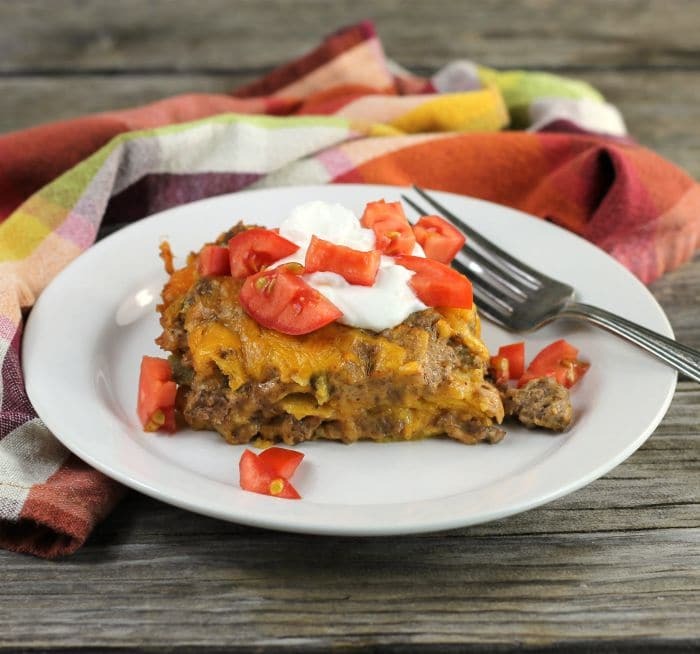 This ground beef tortilla casserole is simple to make and is on the table in about an hour, so it is weekday friendly. 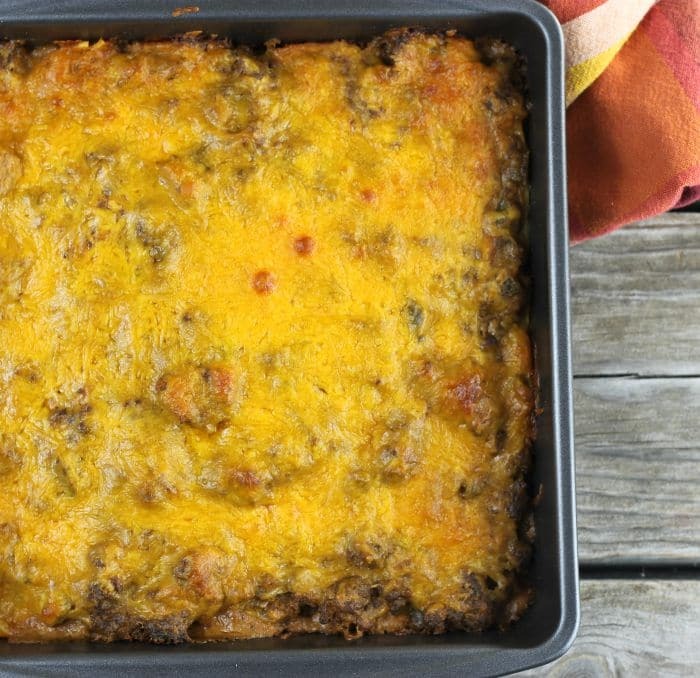 How can you not love a good casserole when the temperatures start to dip? 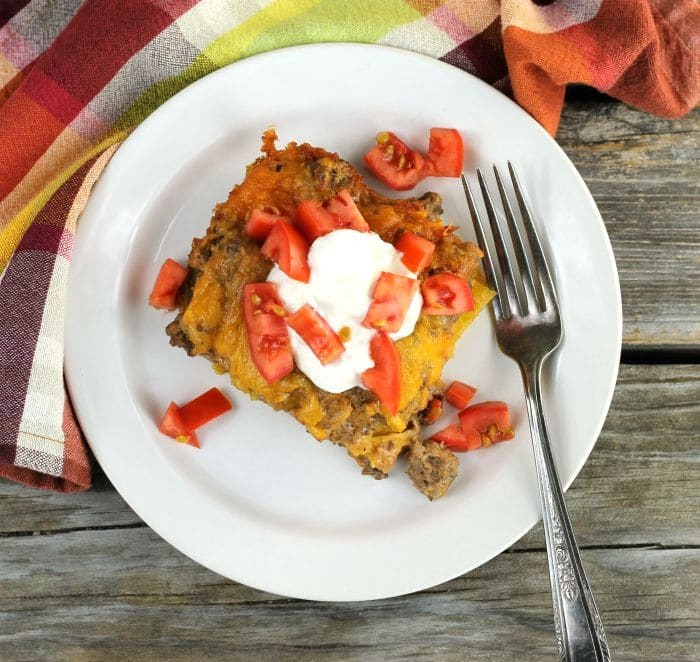 For me, casseroles are the perfect comfort food. They have been a part of my whole life. To start out the recipe you will want to add the ground beef and onions to a skillet. Season the ground beef with cumin, oregano, chili powder, garlic powder, salt, and pepper. Cook until the ground beef is no longer pink and the onion is tender. You will want to stir the ground beef occasionally as it cooks. When the ground beef is browned drain any grease. While the ground beef is browning start the sauce in another skillet. For the sauce, you will melt butter and combine it with flour. Add chicken or beef broth along with milk to make the base of the sauce. Once the sauce is thickened add salsa and sour cream to it. Stir in the ground beef to the sauce. Take corn tortilla shells and cut them into 1-inch strips. Place one-half of the corn tortilla strips on the bottom of the pan. Top with the ground beef mixture and cheese, then repeat. Bake in the oven for 30 minutes and enjoy. Stay in touch with me on Facebook, Twitter, Instagram, and Pinterest. In a skillet add the ground beef and onion. Season with the cumin, oregano, chili powder, garlic powder, salt, and pepper. Cook the ground beef until it is no longer pink and the onion is tender. Drain any grease. While the ground beef is browning, in another skillet add the butter and melt. Add the flour and stir until the butter and the flour is combined and smooth. Pour in the broth and milk cook until the mixture becomes thick. Stir in the salsa and sour cream. Add the ground beef to the salsa mixture and mix well. Preheat oven to 350 degrees F.
Cut 8 corn tortilla shells into 1-inch strips. Place half of the strips in the bottom of a 9 x9-inch baking dish. Top the corn tortilla shells with the ground beef mixture. Sprinkle one half of the cheese on top of the ground beef. Repeat these steps one more time. Bake in the preheated oven until the cheese is melted and lightly browned. When serving top with additional sour cream and tomatoes if desired. 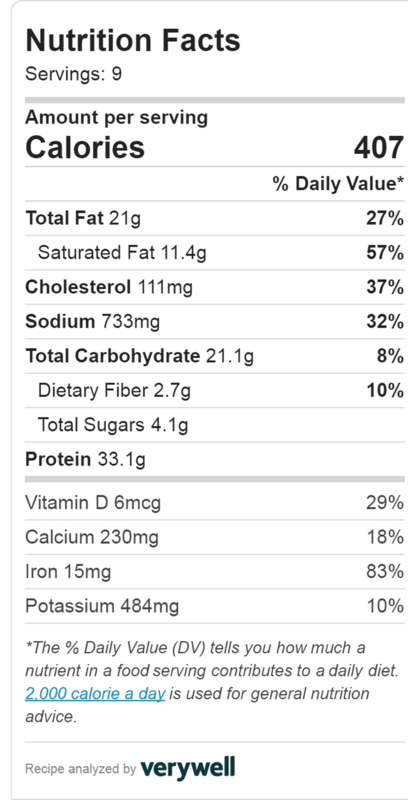 Nutrition information is an estimate and may vary with brands of ingredients used. That looks super comforting and moreish! 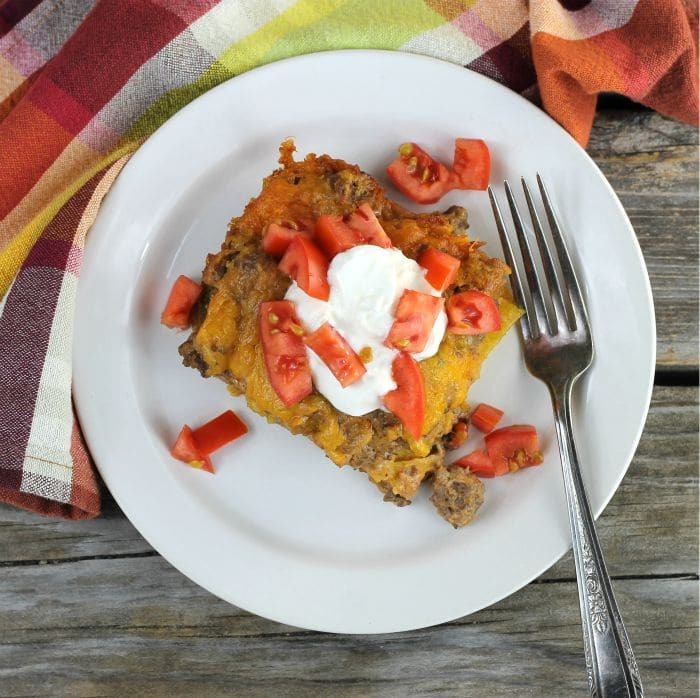 Delicious and tasty casserole…I absolutely love one dish meal…such a comforting dish! Thanks for sharing it…have a wonderful week Dawn! Good recipe! I love homey and comforting dishes like this. Lotta flavor in this one, too — always a good thing! Thanks. Here in Sweden it’s Taco Friday. They say that the reason there are so few Mexican restaurants here is because everyone eats tacos on Friday. I love this casserole and will be making Friday night. Unfortunately we don’t get real corn tortillas here or have masa harina in our stores, so I’ll be making my own corn flour tortillas for this. This is right up my alley! I make one similar to this and will have to try your version. Thanks, Dawn! This is perfect for dinner tonight. Easy to make and looks amazing. The melted cheese made me want to make it right now! While the temperatures won’t be dropping in Florida anytime soon, it wouldn’t stop me from making your casserole. BTW, I just wanted to let you know that the right side of your posts don’t show up on my computer. While I can get the idea of what you are writing, part of each sentence is chopped off.